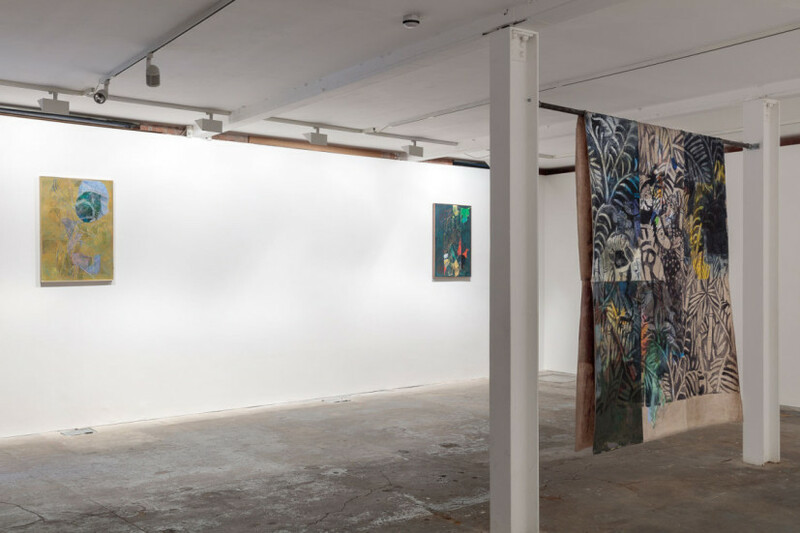 Nicholas Byrne, Finish your sentence, installation view, Vilma Gold, London, 2015. Image courtesy the artist and Vilma Gold, London. Photo: Mark Blower. 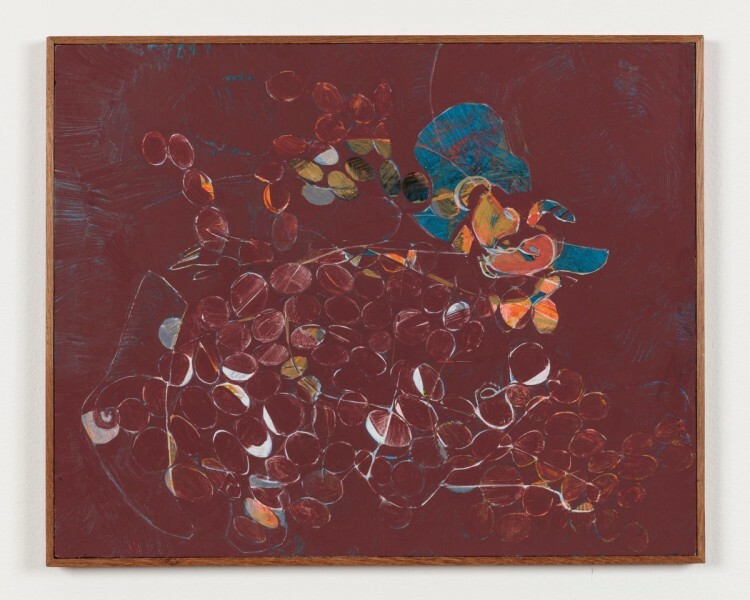 Nicholas Byrne, S / Boris Bucan (facing front wall), oil on linen and thread, 220 x 180 cm, 2015. Image courtesy the artist and Vilma Gold, London. Photo: Mark Blower. Nicholas Byrne, The cave, oil on gessoed panel with artists frame, 50 x 40 x 2 cm, 2015. Image courtesy the artist and Vilma Gold, London. Photo: Mark Blower. 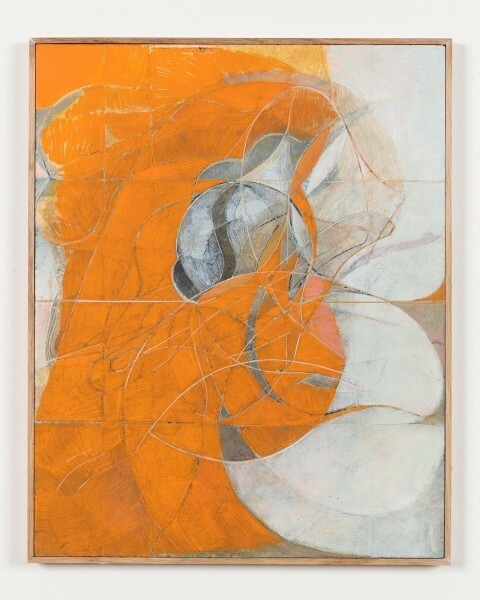 Nicholas Byrne, Past life, orange, oil on gessoed panel with artists frame, 50 x 40 x 2 cm, 2015. Image courtesy the artist and Vilma Gold, London. Photo: Mark Blower. Nicholas Byrne, Clock face and curls, oil on gessoed panel with artists frame, 50 x 40 x 2 cm, 2015. Image courtesy the artist and Vilma Gold, London. Photo: Mark Blower. Nicholas Byrne, You turn and turn. Levitating figure, oil on gessoed panel with artists frame, 50 x 40 x 2cm, 2015. Image courtesy the artist and Vilma Gold, London. Photo: Mark Blower. 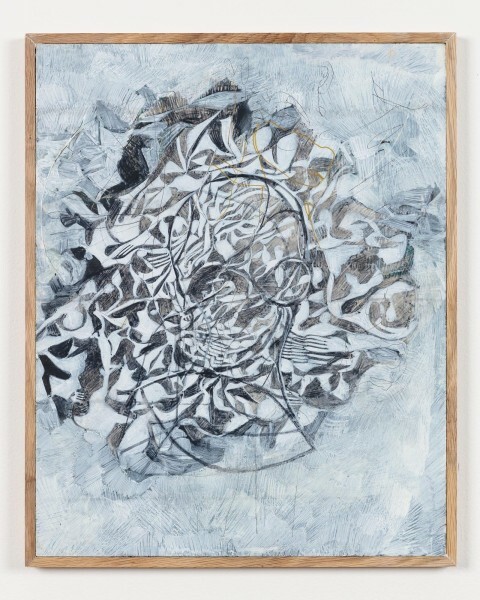 Nicholas Byrne, Screen drawing, oil on gessoed panel with artists frame, 100 x 70 x 2cm, 2015. Image courtesy the artist and Vilma Gold, London. Photo: Mark Blower. In approaching the work of Nicholas Byrne, one must first and foremost consider the physicality of his paintings. Yes, they do feature elements of figuration: isolated heads, disembodied lips and hands emerge from dense compositions of abstract devices, and the artist is interested in a sensory response to subject matter. But it is the physical response to the paintings as objects that is really at stake. Generally quite modest in scale, the works are intense and demanding of the viewer. You have to get in close and look hard. Note that all the works are framed by the artist himself, so that the object is considered as a totality. 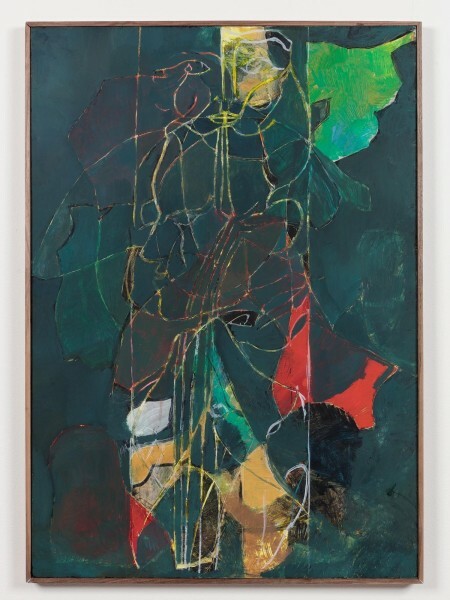 In previous shows, such as the one at Studio Voltaire in 2008, Byrne has included sculpture as well as painting. In the current show the central space of the gallery is taken up by two large paintings on linen suspended, unframed and not even stretched. It would be easy to be blown off course by the sheer accomplishment of the painting, or the way the works borrow from the instantly recognisable pallet of British Modernism: the oranges are Bacon’s, the glowering yellows straight out of Sutherland. Byrne grew up in Oldham, near Manchester, and it was in the museums there that he first encountered a painting language that he has been manhandling ever since. Each work begins with a process of drawing and in the finished painting one senses the vestiges of figures and forms that were born in this early stage, but whose integrity was quickly subsumed within the final scheme of the work. Passages of intricate, curvilinear abstraction emerge from veils of thinly applied colour – and then most characteristically, the artist incises the surface with other strata of composition. This has been described in terms of an act of violence, and prompts me to make a connection to the work of John Stezaker, who taught Byrne at the Royal College of Art. In Stezaker’s collages the cut, the splicing of two separate images is a willed schism designed to interrupt the viewer’s ‘consumption’ of visual matter. Byrne’s precise incisions, no matter how elegantly achieved, function in similarly surgical style to reveal the hidden musculature of the painting. The majority of paintings here are oil on gessoed panel, and it is the gesso layer that allows for the depth of the line cut in with blade or stylus. 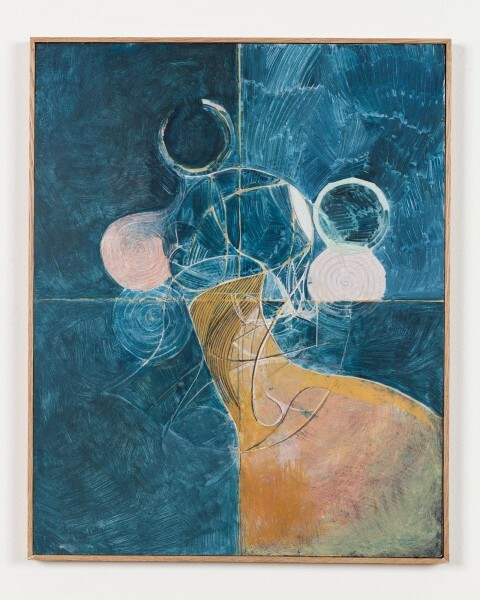 Rather than a question of rupture such as collage technique offers, there may be an echo here of Surrealist interest in psychological metaphors of the subterranean – automatic writing is certainly a reference the artist has alluded to in the past. I should say too that this a really beautifully hung show. 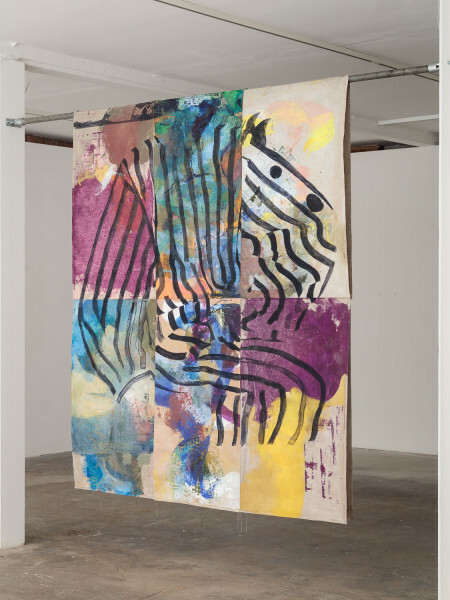 To the left of the entrance, on its own is the largest wall-based work, Screen Drawing 2015, demonstrating Byrne’s increasing tendency towards a more complete abstraction. 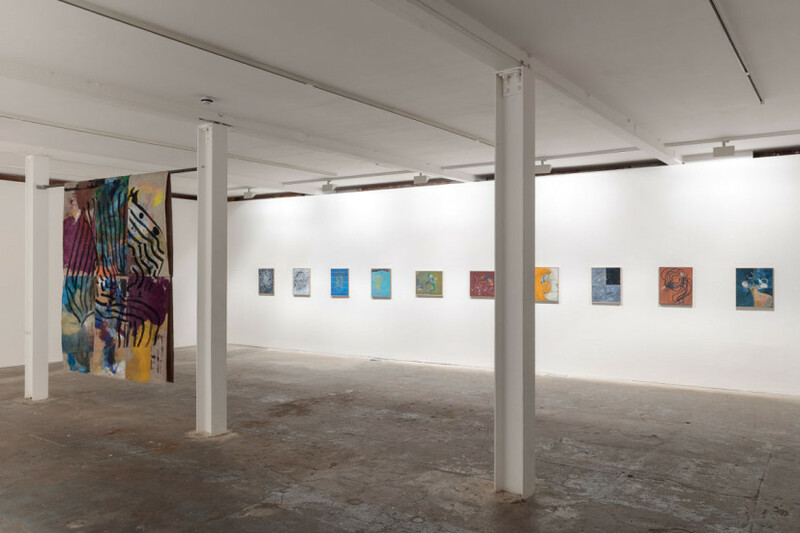 On the back wall of the gallery are ten small works all also dated 2015 through which one can trace morphing iterations of motifs. Then in the centre of the space, back to back are very large scale works that quote respectively from Raoul Dufy and Boris Bućan, as well as connecting to Byrne’s interest in theatrical sets. The incisions that feature in the framed works are here echoed in the patchwork of panels that make up these 2m square paintings; this emphasis on the physical presence of the work is emphasised by listing the thread that stitches them together as one of the media. There is still a week in which to catch this substantial show by an artist whose work surely deserves to be far better known.